Even as he is confident that the position of the Congress in all four Lok Sabha segments is strong, CM Virbhadra Singh today said the pick-and-choose policy adopted by the party in taking back rebels had damaged the party. Chief Minister Virbhadra Singh today said it was for the first time that the BJP indulged in personality cult, undermining the organisation. Congress candidate Chander Kumar has turned out to be the most frugal in the elections. He has spent about Rs 25 lakh during his election campaign against the limit of Rs 70 lakh. The large turnout in the twin districts of Solan and Sirmaur, which is part of the Shimla Lok Sabha seat, is giving anxious moments to candidates who have to wait till May 16 for the results. As contestants, party workers and political analysts are busy analysing voter turnout in the election concluded here yesterday, a substantial increase in the polling percentage has made their work a bit tricky. In order to curb malpractices and bring transparency during voting in the Lok Sabha poll, the Election Commission has made first-ever webcasting of polling booths with the use of cutting-edge technology despite the harsh geographical conditions and insufficient broadband internet connectivity across the region. With Una district topping the poll percentage in the state, political parties are hoping for a good performance here that will brighten their chances of victory. The district recorded an average of 71.39 per cent votes polled in all five Assembly segments, while in 2009, the poll percentage in Una district was just above 62 per cent. The Supreme Court (SC) today stayed the Himachal Pradesh High Court (HC) verdict striking down a law enacted to ensure the quality of education in private educational institutions. The Himachal Pradesh High Court today issued notice to the state government and the managing director (MD) of Himachal Road Transport Corporation (HRTC) for the unauthorised checking of private buses by its officials. A Rs 22-crore sewerage scheme aimed at providing sewerage connections to Solan has failed to find adequate users despite the fact that several houses are openly dumping their waste in the drains. Acting Chief Justice Mansoor Ahmad Mir of the HP High Court has redistributed the Administrative and Executive Business pertaining to Civil and Sessions Divisions in the state amongst judges of the high court with immediate effect. Norms laid down by the National Green Tribunal (NGT) are being flouted here. 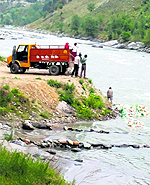 A resident captured a truck dumping waste directly into the Beas near Pirdi village, 3 km from Kullu town, today. The Gregorian Calendar of 1582 is not only relevant, but also significant even today. The Rs 18-crore 100-bed state Mother and Child Hospital to be built in the Kamla Nehru Hospital complex is set to miss its deadline of September this year as the Public Works Department (PWD) is yet to complete the dismantling of old buildings and award the tender to contractor. A five-member team of experts, headed by Prof Nayan Sharma of IIT Roorkee, evaluated the feasibility of extension of the runway of Bhuntar airport, 10 km from here, recently. If one were to look at the data of the past 11 years, he would get to know that forest fires were widespread during 2012 and 2013 affecting forests over an area of 801 hectare and 1,399 hectare, respectively. Excessive use of natural resources with a limited capacity has led to global warming, said Himachal Pradesh University (HPU) Vice-Chancellor ADN Bajpai while delivering a special lecture organised by the Department of Life-Long Learning and Education jointly on the theme “Sustainable rural development” here on Saturday. Members and office-bearers of the state Red Cross Society and the HP Red Cross Hospital Welfare Section, along with students, today observed Red Cross Day by pinning Red Cross flags on Governor Urmila Singh, who is also the president of the HP State Red Cross Society, to mark the occasion. A herd of monkeys today attacked a newspaper hawker near the PWD colony, Sughar, on the outskirts of the town here. Maj General Chandra Shekhar, COS, HQ 9 Corp, Yol Cantt, today visited Sainik School, Sujanpur Tihra. Technology has become an important part of life and without the proper understanding of technology, nothing is possible. Even leading a meaningful life becomes a distant dream without the help of technology. Even as he is confident that the position of the Congress in all four Lok Sabha segments is strong, Chief Minister Virbhadra Singh today said the pick-and-choose policy adopted by the party in taking back rebels had damaged the party in the poll. Back in office after over a month-long hectic campaigning, Virbhadra minced no words in admitting that had the party opened its doors to all rebels who were waiting in the wings, the prospects of the party nominee would have brightened. "All rebels without adopting a policy of pick and choose should have been taken back in the larger interest of the Congress," he said. 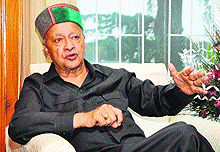 Virbhadra said he was confident that the Congress had done well in all four parliamentary segments and would win. The Chief Minister had, on several occasions in the past, asked the Himachal Pradesh Congress Committee (HPCC) president to take back all 73 rebels who had been issued show-cause notice and those who had been expelled from the party for contesting or working against the official candidate in the last Assembly elections in 2012. Though 28 party leaders, including five former legislators, were taken back into the party on April 24, many Virbhadra loyalists are still awaiting re-entry into the party. Some of them include Yog Raj (Pragpur) and Mast Ram (Karsog). Some other prominent leaders include Prem Lata Thakur, wife of former minister from Kullu Satya Prakash Thakur and Dharamvir Dhami. HPCC president Sukhwinder Sukhu had said the rebels would be taken back only after taking into confidence the block and district units of the party. He had said those whose replies had been found satisfactory had been taken back, while the process for taking back others was on. The Congress had issued show-cause notices to 86 leaders for anti-party activities after the last Assembly elections, while 26 had been expelled for contesting the election or working against the official party nominee. On the other hand, the BJP was liberal in taking back all by opening its doors to all those who wished to return to the party fold. In fact, a large number of Himachal Lokhit Party (HLP) leaders used the occasion to return as they felt that the HLP had no future. Moreover, they felt that the purpose for which the HLP had been floated to fight corruption had virtually been defeated. Talking to mediapersons here, Virbhadra said it was for the first time in his political career of over five decades that an individual had completely eclipsed the party and the entire senior leadership. "The Congress has had some leaders such as Jawaharlal Nehru, who had an international reckoning, but they too were never given prominence over the party," he opined. He said the Congress never had the tradition of declaring its prime ministerial candidate before the elections which was adhered to even in this election. "This is a way of respecting people's mandate and also ensuring that the elected MPs are free to choose their leader," he said. The Chief Minister said it was not only the BJP which projected Modi as the only leader it had, but the Gujarat Chief Minister also sought votes to ensure that he became the next prime minister. "The worst part of such a campaign is that the BJP has been completely undermined just to promote an individual," he said. He added that the entire BJP campaign talked of "Modi sarkar" with not even the remotest mention of a "BJP sarkar". In reply to a query about the possible outcome of the election in view of the heavy voter turnout, he said he did not believe in making this kind of speculation. "I do not like to speculate on the basis of voter turnout, but I can say one thing with certainty that the Congress is in a very strong position in all four segments where polling was held yesterday," he said. Congress candidate Chander Kumar has turned out to be the most frugal in the elections. He has spent about Rs 25 lakh during his election campaign against the limit of Rs 70 lakh fixed by the Election Commission. As per information collected from the office of the returning officer for the Kangra constituency, Chander Kumar has actually declared an expenditure of just about Rs 11 lakh. The rest of the expenditure has been included in his account by the teams of the election observer that observed and videotaped election-related activities in various Assembly constituencies of Kangra. There are 17 Assembly constituencies in the Kangra parliamentary constituency, including 13 in Kangra district and four in Chamba district. Chander Kumar's expenditure remained low as he did not organise any big rally of a national leader during the campaigning days. The rally of Rahul Gandhi, Congress vice-president, was organised in the Kangra constituency before Chander Kumar filed the nomination papers and so was not included in his expenditure. The AAP candidate whose campaign was not visible has spent more than Chander Kumar. Sources in the office of the returning officer said AAP candidate Rajan Sushant had declared his expenditure as Rs 28 lakh. Sushant carried out door-to-door campaign. He did not organise any big rally or issue any advertisement in newspapers. Shanta Kumar, BJP candidate from the Kangra constituency, declared the maximum expenditure. As per the information available with the office of the district returning office, Shanta Kumar's expenditure during the election campaigning was about Rs 45 lakh. During the campaigning, Shanta Kumar had been appealing to his supporters to restrict the election expenditure. Even during the filing of his nomination papers, Shanta Kumar had asked his supporters to bring just one car from each Assembly constituency to restrict the election expenditure. However, the expenditure of Shanta Kumar is almost double than the Congress candidate. Sources here said Shanta Kumar's expenditure increased due to the rallies of Narendra Modi, the BJP's prime ministerial candidate, at Palampur. The expenditure incurred during the visit of yoga guru Ramdev to campaign for Shanta Kumar was also included in his expenditure. BSP candidate Lal Hussain incurred the minimum expenditure during election. His expenditure was limited to just about Rs 1 lakh that he had earned after the sale of his wheat crop. Though the BJP candidate incurred the maximum expenditure in the Kangra constituency, none of the contesting candidates was not even close to the Rs 70 lakh limit fixed by the Election Commission for them. The poll percentage has registered a marked improvement. Against 57.99 per cent voting witnessed in the 2009 Lok Sabha poll in Solan district, it has now risen to 67.16 per cent, while in the neighbouring Sirmaur district, an increase of 9 per cent has been recorded with the final voting figure being 70.23 per cent as against 61.35 per cent voting recorded in 2009 poll. The highest voting in Sirmaur district has been witnessed in Baikuan booth of the Paonta Sahib Assembly constituency where 92.52 per cent voting was witnessed, while the lowest voting was recorded at Kando Bhatnol polling station of the Shillai constituency where the figure was a dismal 45.32 per cent. In the Nalagarh Assembly segment of Solan district, the highest polling percentage of 99.17 per cent was witnessed in the Mandiarpur booth where out of the 241 voters 239 had turned up to vote. The lowest voting of 39.22 per cent was recorded in the Lunas polling booth where out of the 882 voters only 346 exercised their right to vote. With a large number of youth and women voters having exercised their right to vote even in the rural areas, the extensive voter awareness programmes carried out by the Election Commission to encourage the electorate to vote appear to have yielded fruit. Interestingly, politicians are attributing the large turnout to their aggressive campaigning and though it is generally an indication of anti-incumbency for the candidates, results will prove who benefits from this situation. Since the voting percentage has been much higher than Shimla district, the fate of the winning candidate from the Shimla Lok Sabha seat was dependent on who will gain the maximum lead from these two districts. The BJP had gained a lead of 32,523 votes in 2009 and this had proved crucial for their victory in 2009. The number of women turnout in Sirmaur was 1,04,989 which was 68.01 per cent of the total turnout, while 1,26,112 men had cast votes and this comprised 73.19 per cent of the voters. In Solan district, 1,23,473 males, which comprised 68.64 per cent of the total voters, had voted while the share of female voters was 1,07,972 and this was 65.64 per cent of the total voter share. The voters turnout has registered an increase of about 11 per cent than the last General Election in 2009. While polling percentage during the 2009 General Election was 55.21 per cent in the state, it has increased to 66 per cent in this election. Since 11 per cent increase in polling per cent is a sizeable increase, different people are analysing it in their own way. Though there is a general perception among people that the higher voter turnout is an indication of vote for change, ther are so many other factors, which are also attributed for the increase in polling percentage. Bharatiya Janata Party (BJP) leaders and supporters are terming the high percentage as an urge to vote for change. However, there are many political analysts who are terming the increase as natural and attributing factors such as enhanced mass awakening to participate in the democratic process in electing the government, the Election Commission’s drive to enroll voters, etc. Conducive and dry weather conditions, long hours of voting from 7 am to 6 pm, distribution of voter slips in the houses of the voters, better facilities at polling booths such as setting up of chairs for waiting voters, drinking water facility have also helped in increasing turnout in polling percentage. Consequently, Chamba district has topped in Himachal Pradesh in managing the facility of live webcasting of 49 polling booths while Bilaspur district is on the second position with 20 polling booths where the webcasting arrangements were available, as per the information with the official National Informatics Centre (NIC) website of the government. Deputy Commissioner of Chamba Kadam Sandeep Vasant, who is also the district election officer, revealed that the figures included 18 polling booths in Chamba, 12 in Bhattiyat, nine in Dalhousie, six in Churah, and four in Bharmour assembly segments. The live webcast facility had been managed in all five Assembly segments of the district falling under Kangra and Mandi parliamentary constituencies, the DC said. Women’s issues can play a key role in the outcome of the results as they outnumbered men voters in Una. As compared to 1,28,814 men who cast their votes, there were 1,34,924 women who went to the polling stations to exercise their franchise. The percentage of women voters exceeded men in all the five Assembly segments. The Haroli Assembly segment, represented by Industry Minister Mukesh Agnihotri, topped the poll percentage among 68 segments of the state. Here, 79.65 per cent women cast their votes as compared to 70.44 per cent men, taking the overall votes cast in the Haroli segment to 74.87 per cent. People had expected a high poll percentage in Haroli as the minister spent most of his time holding corner meetings or doing door-to-door campaigning in the entire length and breadth of the segment. Haroli has remained the envy of other MLAs from the district, belonging to both parties as there have been allegations that most of the developmental works were done in the Haroli segment during the past 16 months at the cost of other segments. The ongoing endless political debates at grassroot level only conclude that results of this segment were most keenly awaited in Una. BJP stalwart Satpal Singh Satti also remained glued to his Una Sadar segment since he would prefer to better his performance as compared to the last Assembly elections to maintain his stature as the state party chief. Gagret Congress MLA Rakesh Kalia got very little canvassing time as the AICC secretary and party co-incharge of Madhya Pradesh was busy campaigning there. Moreover, there were reports of him being hospitalised during the run up to the elections in Himachal Pradesh. As per sources, Kalia might have preferred to remain silent due to some internal party politics. He had openly vented out his reservations on the lopsided development in the district during CM Virbhadra Singh’s visits here and had specifically pointed out at CM’s public meetings that Haroli was being given more importance as compared to Gagret. The Bahujan Samaj Party and the Aam Aadmi Party cadre failed to make any significant impact among masses here. However, there are reports that both parties did manage to make some inroads into the district’s vote bank. Only, the results will say whether the increase in poll per cent this time by about 10 per cent as compared to the 2009 elections could be attributed to BJP’s much publicised ‘Modi factor’ in this district. A Bench, comprising Justices TS Thakur and C Nagappan, passed the order on an appeal filed by the state government challenging the October 19, 2013, judgment of the HC. The apex court had issued notice to the HP Private Universities Management Association on December 16 seeking its response within six weeks to the government’s petition. The HC had quashed the HP Private Educational Institutions (Regulatory Commission) Act 2010, citing lack of legislative competence. Though the private universities had challenged the Act on several grounds and the state government had made diverse submissions on the provisions of the law, “the reasoning of the HC was tailored to examining only the question of constitutionality in terms of legislative competence,” the appeal in the SC said. The state enacted the law as it felt the need to protect the interests of the student community and the public at large in the light of growing commercialisation of education and the exploitative practices of private educational institutions. The regulatory commission set up under the Act was to take steps to maintain quality of education being provided by these institutions besides keeping a check on the fees charged by them, the government explained. Basically, it would act as an interface between the state and the central regulatory bodies. The state contended that it had exclusive power under the Constitution to enact laws to incorporate, regulate and wind up universities. It argued that public interest would suffer irreparable damage as the very existence of the regulatory authority had been wiped out by the HC verdict. Because there was a presumption of constitutionality to laws, the HC, at the maximum, could have read down the provisions of the Act in question to render it within constitutional limits, it pleaded. A Division Bench comprising Acting Chief Justice Mansoor Ahemad Mir and Justice VK Sharma directed the MD, HRTC, to file his response within three weeks and list the matter by May 29. The petitioner society alleged it was running buses under a stage carriage permit granted by the regional transport authority. The HRTC or its employees have no concern with the buses plied by the society. It is contended that the HRTC is one of the competitors and checking by its staff is adversely affecting the society’s business. It is alleged that for this reason only, buses get delayed and fail to reach the destination in time. It is also alleged that complaints in this regard were submitted to the Deputy Commissioner and the Superintendent of Police, Hamirpur, but to no avail. The petitioner has urged the court to direct the respondents to take an appropriate action and declare the action of HRTC officials as illegal. The scheme is being executed by the Irrigation and Public Health (IPH) Department in four zones of the town at Rs 60 crore. The department had initially laid the sewerage in almost 50 to 60 per cent of the town covering prime areas such as Officers’ Colony, Madhuban Colony, Rajgarh Road, Kotla Nullah, Tank Road, Lower Bazar and Hospital Road at a cost of Rs 22 crore. The scheme was supposed to connect the entire town. The first phase was completed in 2008 and despite the presence of 1,600 households barely 25-30 per cent people had come forward to take connections. Though the number of users had increased in 2012, the poor response had reduced the utility of this scheme. Executive Engineer, IPH Department, Hemant Tanwar, while confirming that the scheme was underutilised, said they were trying to increase the users by making available free application forms. Though new houses which were being constructed were coming forward to seek connections, response from the existing houses was rather dismal. poor response was acting as an impediment. Interestingly, the work of a new hospital building had come to a halt as labourers had refused to work with the surrounding building dwellers openly dumping their sewage in the vicinity of the new building. The contractor rued that despite informing the hospital management about this unhygienic situation, little had been done to solve the problem, thus forcing them to halt work. While the poor response was also attributed to the 50 per cent cost of water bills and obstructions created by neighbouring in laying the sewer pipes of other people pass through their lands, little had been done by the local municipal committee to undertake a mass campaign to educate people. As per the notification issued in this regard by the Registrar General of the court, the work of Civil and Sessions Division, Shimla, has been assigned to Justice Sanjay Karol while Kangra division has been assigned to Justice Rajiv Sharma. Justice VK Sharma will look after the work of Mandi division. The work of Solan and Una division has been assigned to Justice Dharam Chand Chaudhary. Justice Tarlok Singh Chauhan will look after Bilaspur and Hamirpur segments. The Chamba and Kullu divisions have been assigned to Justice PS Rana while Justice Sureshwar Thakur will look after the Sirmaur and Kinnaur division. A PWD truck dumps waste alleged to be Congress campaign material of Sonia Gandhi's recent rally directly into the Beas near Pirdi on Wednesday. A picture released on a social networking website shows a PWD truck dumping waste into the Beas, alleged to be Congress' campaign material of Sonia Gandhi's recent rally. The resident, on the condition of anonymity, said the offenders fled from the scene and he managed to make a video recording of the act. The matter of dumping waste, raised in the NGT by environmentalist Abhishek Rai is still pending and the NGT had last year issued orders authorising municipal committees of Kullu, Manali and Bhuntar to impose hefty fines on environmental degradation caused by dumping of waste near Beas. It started a composite scheme for restoration as well as for channelising sewage discharge from the State Pollution Control Board (SPCB). Very little is seemingly being done to check or prevent dumping of waste by the authorities concerned. The Municipal Committee, Kullu, has not imposed even a single fine after these orders came into force. Municipal authorities accepted that they could only act on a complaint, as they had little resources to regularly monitor the entire stretch of the Beas. Congress leaders said they had deposited the requisite fees with the PWD and the Municipal Committee, Kullu, and were not aware about any waste being dumped into the Beas. The PWD authorities denied any knowledge of the act and assured strict action against the offenders. This was stated by KK Qureshi, a teacher from Rajgarh, Madhya Pradesh, who was here to deliver a special lecture on the Gregorian Calendar at the Himachal Pradesh University (HPU) auditorium. A President medal awardee, Qureshi, said five years of hard research work had helped him in preparing the one million years calendar. The calendar would help research work and planning, he said. The Gregorian Calendar is an internationally accepted civil calendar and also known as the Western or Christian calendar. The calendar is strictly a solar calendar based on a 365-day common year divided into 12 months of irregular lengths. HPU VC ADN Bajpai appreciated the hard work put in by Qureshi. Chief Minister Virbhadra Singh, who had laid the foundation stone of the new project on September 7, 2013, had directed the PWD to complete the project by September this year. But the PWD has not even awarded the tender, leave alone meeting the deadline of September this year, revealed insiders. The hospital will exclusively be dedicated to mothers and newborn babies who will get all treatment and medicines, all diagnosis under a single roof for free. The government has already allocated funds for the project. The hospital has already bought new equipment worth Rs 1 crore for the hospital. The hospital is giving free treatment and medicines to both mother and child admitted to the hospital. They also get all diagnosis under a single roof for free since March this year, said Dr LS Chaudhary, medical superintendent, state Kamla Nehru Mother and Child Hospital. Dr Chaudhary said the diagnosis services had been outsourced to a private lab which provided the services for free to patients. The 100-bed new five-storey building would have a 24x7 emergency and patients would get the-state-of-the-art facilities. It would have 274-bed capacity, he added. The patients rued that they had to share a single bed in general wards and share a room in private wards as the patient load had increased over the years. The health and hygiene in the general wards was not proper. “The old buildings will be dismantled and the new building will take care of the patient load,” said Dr Chaudhary. The patients also got parking facilities for over 100 vehicles, taking care of chaos that governed the hospital premises these days, added the officials. Executive Engineer, PWD, Deepak Raj, in charge of the project, said the dismantling work would be compete in 10 days and the tender would be awarded soon. The work would be completed in two years as the hospital lay in the cold zone and work in winter came to standstill. Airport Director YK Sharma confirmed that the team would conduct a two-day survey and discuss the possibilities of elongating the airstrip. The extension of the runway will allow bigger aircraft to land here and relax present load restrictions and stipulations imposed by the DGCA. Aviation experts said though larger aircraft were allowed to operate earlier, after the Air India crash at the Mangalore airport in 2003, around 10 airports around the country, including the Bhuntar airport, were re-categorised and imposed with higher stipulations for safety reasons. Travel agents and taxi associations have expressed happiness on the proposed expansion of the airstrip. Bhupender Thakur, patron, Kullu Travel Agents Association, said, “Extension of the airport will invite other major air carriers and lower air fares to Kullu." If one were to look at the data of the past 11 years, he would get to know that forest fires were widespread during 2012 and 2013 affecting forests over an area of 801 hectare and 1,399 hectare, respectively. Thus, there is little likelihood of accumulation of combustible matter in forests and, hence, forest fires are likely to be fewer in the current year. Moreover, the climate favoured our forests with a good amount of precipitation and rainy days as well as wet conditions. Revealing this here recently, a senior forest official said the Chamba forest circle comprised the entire Chamba district barring the areas managed under the protected areas of wildlife. He said the district comprised five forest divisions spread over 18 ranges. Professor Bajpai said to keep the balance between natural resources and their minimum use, people needed to change their mindset as the rural sector of the country was primarily agriculture-based and with excessive chemical use, the fertility of the land was diminishing. Moreover, the depleting water table, more culture of non-vegetarianism and excessive use of flora and fauna in the forest had led to environmental imbalance. He emphasised the need to revisit the human concept keeping in view the priority for sustainable development. Appreciating the theme for this year, “My Red Cross story”, the Governor said it would go a long way in initiating a dialogue with people to learn about their personal connection with the Red Cross movement, which had touched so many lives. She hoped that the effort would inspire people to contribute towards this largest humanitarian movement of the world with more zeal and dedication in order to mitigate the pain of suffering humanity. While interacting with members of the Red Cross Society, Chief Minister Virbhadra Singh said the Red Cross Society was rendering yeomen services in providing relief to the poor and needy, besides providing necessary aid in case of emergency. The Governor said all the District Red Cross branches in the state were doing commendable work in providing succour to the underprivileged and destitute. She stressed the need for the expansion of the Red Cross activities in a more efficient manner. Members and volunteers of the Himachal chapter of the Indian Red Cross Society, along with students, also pinned Red Cross flags on Health Minister Kaul Singh Thakur who appreciated the efforts of the society. Students of local schools took out a rally to generate awareness about Red Cross among the people. World Red Cross Day is observed on May 8 every year to commemorate the birth anniversary of Sir Henry Dunant, who founded the International Red Cross and Red Crescent Movement in 1863 to protect human life and alleviate human suffering. KULLU: Kullu Deputy Commissioner and District Red Cross Society president Rakesh Kanwar donated blood on the occasion of World Red Cross Day at a district-level function at Devsadan here today. He urged people to donate heartily and join the society to help the needy. He said the Red Cross Society was playing a major role in helping the poor. He said a person could become member of the society by paying a fee of Rs 2. He said the Red Cross Society, along with Punjab National Bank and Axis Bank, had donated one washing machine each to Chandrabha Memorial School for Blind and a child home at Kalheli village. A total of 30 persons, including government officials, ITBP jawans and NCC cadets, donated blood on the occasion. Slogan-writing and painting competitions were also organised wherein schoolchildren participated. It is learnt that Vipan Kumar, the victim, was on his routine duty of distributing newspapers when monkeys attacked him, snatched his mobile and newspaper bag. Vipan fell into a ditch. Later, local residents reached the spot and saved him. Vipan, who received serious injuries, was shifted to the local Civil Hospital for treatment. Meanwhile, Daleep Sharma, member of People’s Voice, a local voluntary organisation, appealed to the administration to trap monkeys as soon as possible. The objective of his visit was to interact with teachers and students of the school. The Major General was welcomed by Principal Group Capt TN Sridhar and Registrar Lt Commander Usha Sangwan. The chief guest reviewed the guard of honour and, thereafter, paid homage to war heroes by laying a floral wreath at the Veer Samarak. The principal briefed the chief guest and gave a presentation regarding academic and extracurricular activities of the school. In his address, Chandra Shekhar advised cadets to work hard to achieve their goals. He lauded the achievements of the school and assured the school administration of providing assistance for the development of the school. This was stated by Mohit Mahajan, organiser of a two-day workshop by Sofcon Pvt Ltd, Noida, while addressing 800 students and faculty members of the Himachal Institute of Engineering and Technology (HIET) at Shahpur here yesterday.